Ampthill went down 21-15 against Blackheath as they threw away a commanding first half lead at Rectory Field. In the first half, despite playing against the wind, Ampthill dominated territory and possession, scoring two tries to lead 12-0. 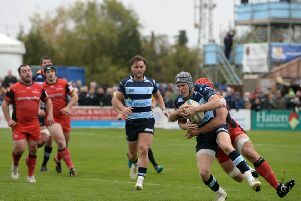 The first went to wing George Elliot in the 17th minute after multiple forward phases in the red zone, before scrum-half Gavin Williams touched down on 26 minutes. Full-back Elliot Clements-Hill converted the first and hit the post with the second. Amps continued to press for another try, spurning a couple of chances before a loose kick into the Blackheath 22 was returned with vengeance, mis-handled and poorly cleared – leaving the hosts with a lineout on A’s 22. The home side are well drilled with their catch & drive routine, earning a 37th minute penalty goal in front of the posts, converted by fly-half Frederick Gabbitass. No sooner had the restart been taken before another turnover and excellent kicking from hand again saw the visitors defending a lineout catch & drive in their 22. The drive was stopped but several phases later Ampthill were adjudged to have infringed and Gabbitass mad no mistake with the penalty. Amps were left wondering how so much ball in the opposition’s half had left them with just a six-point lead at half-time; however, with the wind in their favour, the second half looked full of promise. The first quarter of the second half was a complete reversal, though, with the home side in control. Blackheath scored two tries through number 8 Thomas Stradwick (49 mins) and full-back Owain James (64 mins), sandwiching a penalty goal from Gabbitass on 58 minutes to lead 21-12. The game appeared to be over when Amps lock Karl Braband was adjudged to have illegally challenged the restart in the air which left the visitors a man down for the rest of the match. Despite that handicap, Ampthill fought back, securing a 73rd minute penalty goal converted by Clements-Hill. The visitors had further chances, but a lineout steal by the home side deep in their 22 in the last minute meant that the visitors were forced to settle for a losing bonus point. Head coach Paul Turner said: “This was a game we lost rather than Blackheath won. Having controlled the first half against the elements to lead 12-6 we then lost all game control in the first 15 minutes of the second half, despite the benefit of the wind. Director Of rugby Mark Lavery added “We wanted a reaction to the poor performance at Mowden Park and we got it.